ASTANA – A roundtable discussion titled, “The Implementation of theKazakhstan 2050 Strategy and the Role of Kazakhstan in the International Community,” was held on Sept. 15 in Astana. The diplomatic corps, deputies of parliament and officials from the Kazakh Ministry of Foreign Affairs discussed progress on key goals set out in the strategy. Senate Speaker Kassym-Jomart Tokayev presided over the event organised by the Committee for International Affairs, Defense and Security of the Senate of Parliament. In his opening remarks, Tokayev stressed that Kazakhstan, led by President Nursultan Nazarbayev, managed to achieve in years what has taken many countries centuries in rising from the nihilism of post-perestroika period to prominence in the world political arena. “Kazakhstan has now entered a qualitatively new stage of its development, a stage of large-scale modernisation. Over the last 13 years, Kazakhstan has seen some of the highest economic growth rates anywhere in the world and has rapidly risen up in global rankings,” he continued. Tokayev drew the attention of the audience to the fact that an important aspect of socio-economic and spiritual transformation originates in the country’s Mangilik El (Eternal Nation) idea, which was developed by President Nursultan Nazarbayev. “This concept includes a vision of our core values, the unity of the people, social stability, interethnic harmony and the sustainable development of our country,” he said. “Implementing these bold plans will require an overhaul of our economy, shifting it to a model based on innovation and technology. The concept sets a strategic mission to diversify the economy. 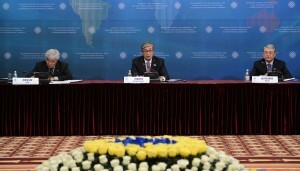 We must also ensure the sustainability of economic growth and business activity,” Tokayev said. He also elaborated upon major steps being taken by the government and parliament to implement the long-term strategy. “The government has initiated a number of programmes, including the second five-year plan of State Programme of Accelerated Industrial and Innovative Development for 2015-2019, infrastructure and agro industry enhancements for2020, Business Road Map 2020 and Productivity 2020he said. In speaking about the situation in Ukraine, Tokayev underscored that Kazakhstan expresses serious concern over developments in that country. In finishing his speech, the Chairman of the Senate expressed his confidence that Kazakhstan 2050 will help guide the country through the choppy waters ahead. “The President, government and our parliament are all working to turn our vision into a reality. Our people are united in their aspiration to turn their homeland into a more successful nation,” he concluded. During the discussions, roundtable participants stressed that extensive work has been done since the launch of the strategy, including the adoption of relevant legislation andthe approval of sectoral programmes in various areas. According to foreign ambassadors, against the backdrop of the ongoing economic crisis and political instability around the world, the new strategy is particularly valuable for determining the future course of the development of the state. Addressing the attendees, Russian Ambassador to Kazakhstan Mikhail Bocharnikov stressed that his country supports the course of development laid out in the strategy. “We wish Kazakhstan, our close partner and ally, every success in achieving these goals,” he said. During the discussion, Foreign Minister Erlan Idrissov made a report, telling the gathering about the progress made in foreign policy initiatives in line with the strategy. In Bouchez’s words, another of the many merits of the strategy is the quest for qualitative development. Kazakhstan has already achieved impressive quantity results, she said. “It is a young but mature state. There is much more work needed to be done for it to become one of the 30 most developed countries worldwide – which is Kazakhstan’s goal- as well as being able to meet citizens’ higher expectations,” she said. “It is the third key feature of the 2050 strategy, a major one indeed, is that it is laying the foundation for stability. I was impressed by the 10 challenges list at the start of the strategy. And the situation in the region is even tenser now than it was two years ago,” Boushez noted. “This makes Kazakhstan’s role as a stability producer and exporter even more crucial. Kazakhstan’s prosperity, inter-ethnic tolerance, and friendly, peace seeking foreign policy is a key asset for the region and beyond,” she continued. “We view with great interest Kazakhstan’s active role in the revival of Silk Road concepts such as the Western Europe-Western China transport corridor. We appreciate Kazakhstan’s active support for the EU Central Asia Strategy. We appreciate the efforts of Kazakhstan to call the parties engaged in Ukraine crisis for a peaceful resolution and stop the bloodshed. Let me underline that the EU highly values Kazakhstan’s multivectoral policy and economic pragmatism,” Bouchez noted. “In our view, the ongoing security challenges in the world demand preventive soft power policies. Sustainable state institutions, based on inclusive consensus and economic performance, attachment to and respect for international law, support to global policies – all are key requirements – and they are part of Kazakhstan Strategy 2050. 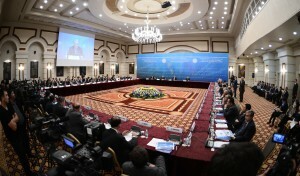 Stability starts inside, and the country’s prosperity and unity thanks to the interethnic concord and culture of tolerance around Kazakhstan’s Eternal nation, are key assets in this regard,” she concluded. Chargé d’Affaires of the United States to Kazakhstan John Ordway said the strategy stipulates the critical importance of reducing the state’s role in the economy. “This is especially important for capital market formation, which is suffering because of a striking absence of tradable securities. It is also important to create opportunities for small and medium-sized businesses. Spinning of service, support, and other non-core functions of Samruk Kazyna andlaunching other IPOs will be key,” he said. “The strategy also emphasises the importance of the gradual development of democratic institutions. As I have heard from President Nazarbayev, free markets cannot develop unless there is a free society. This is a prerequisite for stable, predictable, long-term development and prosperity,” Ordway noted. Ordway stressed that Kazakhstan is an important strategic partner of the United States. “U.S. 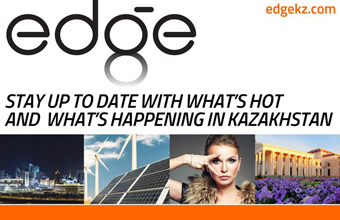 companies are among Kazakhstan’s first and biggest investors. 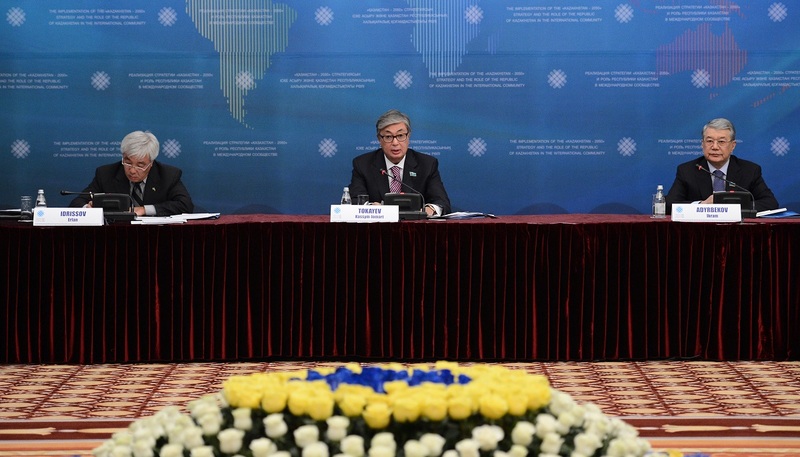 The long-term prosperity, stability and freedom of Kazakhstan are our shared interests too,” he concluded. Acting UN Resident Coordinator in Kazakhstan, UNFPA Sub-regional Office Director Nikolai Botev called the 2050 strategy proof of the state’s commitment to a forward-looking approach and ability to plan ahead. “Such a strategy is of particular importance as we are engaged in planning for the next five-year programming cycle and we see this as an opportunity to make a strategic contribution to Kazakhstan’s development by drawing on the collective strengths of all 21 UN agencies working in Kazakhstan,” he noted. Botev highlighted the parallels between the 2050 strategy and the United Nations post-2015 Millenium Development Goals (MDGs) that seek to promote human rights, equality and sustainability. He pointed out that throughout its membership in the United Nations, Kazakhstan has made sound, strategic choices in choosing the causes it supports and has often linked them to forward-looking, multilateral initiatives. “Perhaps the most outstanding example of this has been in nuclear disarmament, non-proliferation and nuclear safety. An example in the sphere of culture is the proclamation of the international decade for the rapprochement of cultures, which was an initiative of Kazakhstan,” he stressed. The ambassadors of Belarus, France, Pakistan, the Netherlands and the United Kingdom also took part in the discussion.